Posted 21/03/2019 & filed under Staff Vacancies. Posted 21/12/2018 & filed under Diary and Term Dates. Posted 05/07/2018 & filed under Weekly Update. Click here for the Army Scotland video of Grand Day, hosted on their Facebook site. Posted 09/03/2018 & filed under Weekly Update. 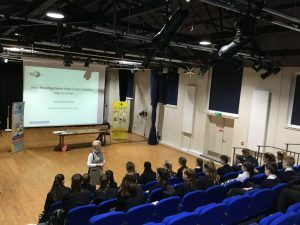 On 8th March, pupils from P7 to S3 were introduced to the ‘Reading Force’ initiative, created by Professor Alison Baverstock of Kingston University. 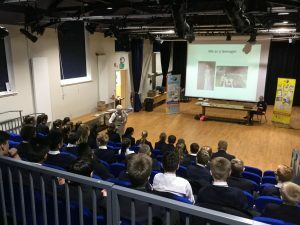 Alison herself has been a Service wife, and has created the scheme to encourage reading and literary based conversation between Service pupils and their families, often deployed. 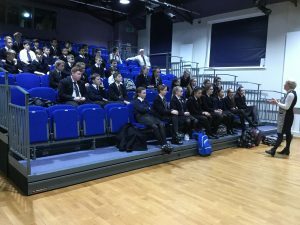 She gave a presentation to our pupils describing her experiences with staying in touch with deployed family members, and how Reading Force can help. Reading Force provides a scrapbook for pupils to use alongside reading a book of their choice, while members of their families read the same book. The hope is that this provides opportunities for pupils and their families to have conversations to discuss their chosen books. On completion, pupils receive a certificate, some feedback and an age appropriate free book. Pupils will be encouraged to complete their scrapbooks over the Easter break with involvement from family members. Thanks goes to Mr Kirk for organising the event. Posted 19/01/2018 & filed under Weekly Update. 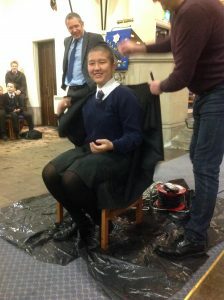 On Friday 19th January, the whole school witnessed an amazing charity event. 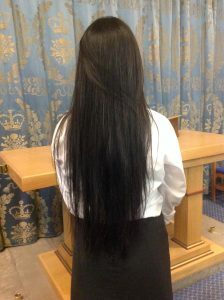 In front of a cheering audience, Anjipa Malla (S5), shed all 36 inches of her shiny locks to raise money for the charity Sentebale. Anjipa is hopeful of raising £755 for the charity. We are so proud of her for taking part in such a selfless act for such a great cause. Sentebale supports orphans and vulnerable children in sub-Saharan Africa, many of whom are affected by the HIV/AIDS epidemic. Through education, psychosocial support and care, they are given the tools needed to lead happy healthy and productive lives. Posted 14/12/2017 & filed under Uncategorised. 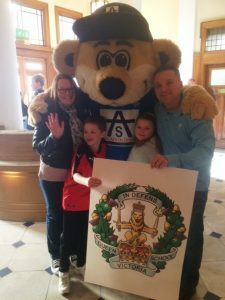 Staff member Mr McConnell recently visited Ibrox with his family, and promoted QVS while there.